Pizza for breakfast? Sure, why not? 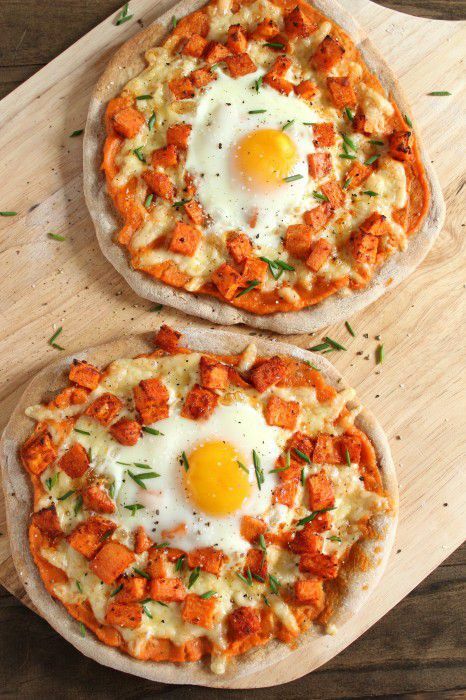 This meatless breakfast pizza combines gouda cheese, eggs, and roasted sweet potatoes. These gorgeous pizzas would be great for a gourmet vegetarian brunch or breakfast in bed surprise. Preheat oven to 400 F. Place half of the sweet potatoes directly on the rack and bake until very soft, about 1 hour. Remove from oven and let cool for 5-10 minutes. Peel and puree sweet potato flesh until smooth; reserve 1 cup. Increase oven heat to 450 F. Peel remaining sweet potatoes and cut into 1/2-inch dice. Toss 2 cups of the diced sweet potatoes with 1 tablespoon of the olive oil, the garlic powder, onion powder, paprika, cayenne, and salt and pepper to taste. Place in an even layer on a baking sheet. Roast, stirring halfway, until softened but not yet crisp, about 15-20 minutes. Remove from oven. Lightly flour a clean, flat work surface. Roll each ball of whole wheat pizza dough out to about 1/4-inch thickness (about 7 inches in diameter). With remaining 1 teaspoon oil, lightly grease a baking sheet. Transfer rolled out dough to baking sheet. Carefully crack one egg into the center of the sweet potato cubes on each pizza; bake for 8 minutes. Carefully remove the baking sheet from underneath the pizzas, and continue to cook directly on the oven rack until the crusts are golden brown on the bottom, the cheese is melted, and the egg whites are fully set, about 2-4 additional minutes. Carefully remove pizzas from the oven. Season to taste with salt and pepper; top each pizza with 1 tablespoon diced chives.